Crescent Fort Rouge United Church has stood in the heart of Osborne village since 1911. Designed by J.H.G. Russell in the Romanesque style, the interior reflects its Methodist roots with curved pews arranged in a horseshoe shape. The stunning stained-glass windows and warm oak woodwork offer a sense of harmony and intimacy. 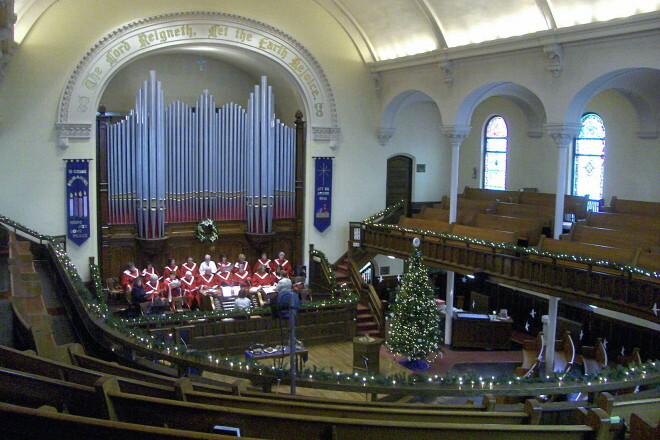 The sanctuary, with its rare 1911 Casavant Freres pipe organ, is one of Winnipeg’s acoustic gems and a popular venue for concerts. The annual spring Artfest invites performers and participants from the community to express themselves and respond. This active congregation welcomes you.